The business lobby is demanding sweeping changes to a proposal to introduce a wage-setting tribunal for the trucking industry, putting it in direct conflict with the union movement. The Australian Industry Group has come out swinging against the Federal Government’s Road Safety Remuneration Bill, which is designed to create a tribunal to rule on pay rates and conditions for employees and owner-drivers. It has lodged a submission with a parliamentary committee inquiring into the Bill urging that the proposal be rejected or, at the very least, amended. 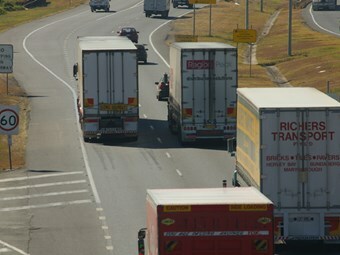 Claiming to be acting "on behalf of the road transport industry and those industries which are the users of road transport", the Ai Group argues the tribunal will impose greater regulatory burden on business and curtail competition. The submission opposes employees being granted access to the tribunal, saying they are already protected by the Fair Work Act, national employment standards, modern awards and enterprise bargaining arrangements. "There has been no evidence that the FW Act or the safety net which applies to employee drivers is unfair or incomplete," the Ai Group says. "The existing arrangements for setting wages and conditions for employee drivers are effective and appropriate. The transfer of responsibilities to another Tribunal is not sensible or desirable." It claims employees could "jurisdiction shop" if given the opportunity to choose between Fair Work Australia and the tribunal. The Bill states drivers who apply to the tribunal cannot apply to Fair Work Australia unless the application to the tribunal has been withdrawn or failed on jurisdictional grounds. The Ai Group has also sought time limits for applications to the tribunal, similar to what exists with Fair Work Australia. The lobby group is pushing for the tribunal’s wage-setting powers to be limited to the long distance sector (journeys over 500km) because the Road Transport (Long Distance Operations) Award is the only modern award that permits cents per kilometre rates. In its 2008 report recommending government intervention in the marketplace, the National Transport Commission (NTC) highlighted the pay method as a likely influence on unsafe driving behaviour. "Accordingly, it is invalid to use an argument for Government intervention based on the nature of driving undertaken by long haul drivers, to apply onerous new Regulations to those performing non-long haul work," the Ai Group's submission reads. The proposal, if accepted, would drastically reduce the coverage of the tribunal because those with employees under the Road Transport and Distribution Award would be exempt. The submission goes on to recommend a delay of one year in the tribunal’s ability to issue remuneration orders and to hear disputes. Furthermore, the Ai Group is seeking transitional arrangements if the Bill is passed to give the industry time to adjust. Despite academic reports citing a link between low rates of pay and poor safety, the Ai Group has continued to dismiss the argument that higher pay will reduce accidents. "A causal connection between remuneration and road safety has not been definitely established," it says. The submission labels the tribunal as something that will "distract" government and industry from pursuing measures the Ai Group believes will improve safety. It lists improved roads, fatigue management, education and training and strong compliance and enforcement as examples. "Education and enforcement of the existing laws needs to be a key focus. It is simplistic to perceive increases in remuneration as the silver bullet which will strike down problems of safety in the road transport industry," the Ai Group says. It also warns that "any significant increases in road transport costs" will damage businesses competing internationally and hit the struggling manufacturing and retail sectors. The Ai Group is also dismissive of the tribunal’s ability to set rates and remuneration related conditions for owner-drivers due to the varied nature of the freight task the different costs of individual operators. "The risk for the industry is that a "one size fits all" model will be imposed which substantially increases costs, but fails to improve safety," the submission says. However, it adds that any rate increases awarded to a driver "should be absorbed, as far as possible, by the driver’s existing road transport contract". The Ai Group says new national workplace health and safety laws and chain of responsibility obligations that hold all parties accountable for managing speed, fatigue and vehicle mass are capable of addressing unsafe practices. "The Bill also adversely impacts upon the responsibility of workers to take reasonable care for their own health and safety while at work," it says. The submission claims the prospect of union payback is a likely threat if the tribunal goes ahead as currently proposed. The Ai Group wants changes to a provision in the Bill requiring representative associations to gain the consent of all their members before making an application to the tribunal. "The provisions would likely lead to industrial retribution as a result of the requirement for an industrial association to identify all of their members that support their application for an RSRO [road safety remuneration order]," it says. "This is not an academic point as in NSW the TWU [Transport Workers Union] has previously threatened to engage in industrial campaigns against members of associations who pursue proceedings to vary Contract Determinations to the perceived detriment of owner drivers." The submission claims the Bill, unless amended, will reduce the likelihood of applications from employers, hirers or other businesses within the supply chain. It has also criticised the tribunal’s ability to refuse to hear applications, saying industrial associations should be given the opportunity to prosecute their cases. "The unfettered ability for the Tribunal to refuse to hear an application from an industrial association (other than one that represents employees) is extremely unfair. Unbalanced and unfair provisions of this type damage the legitimacy of the Tribunal," the Ai Group says. The lobby group’s stance has drawn the ire of the TWU, with National Secretary Tony Sheldon telling The Australian it would have "blood on its hands" if it succeeded in getting the Bill scrapped. The union has also lodged a submission with the parliamentary inquiry, largely reiterating its claims of a link between rates of pay and safety. The TWU argues the tribunal will be effective because it will cover the entire supply chain and have the power to make binding rulings. "The financial power of clients in the transport industry makes their involvement in a system of safe rates and conditions essential," the union says. "Decisions over price, timing, destination and route is almost exclusively a prerogative that belongs to the client." The TWU wants the tribunal’s scope to cover rates, conditions, trip planning, occupational and public health and safety, training and education and cost recovery. It says it should be given the flexibility to respond to changes in variables such as oil prices. "It should be able to make determinations for both the long and short haul sectors as the safety crisis does not distinguish between the two," the TWU says. The report refutes a number of arguments against a safe rates tribunal, including that it will increase the cost of running a business and consumer goods. "This view does not account for the fact that under the status quo, consumers are currently paying for poor practices within the supply chains," the union says. Drawing on the work of professors Michael Quinlan, Ann Williamson and Michael Belzer who have repeatedly cited a link between pay and safety, the TWU says existing road enforcement strategies are inadequate because they do not address underlying economic factors that encourage unsafe practices. "In other words, traditional strategies make the literally fatal error of being directed towards the consequences not the causes – as such they can never strike at the heart of the problem," it says. The Federal Government late last year announced plans to create the tribunal, which will be housed within Fair Work Australia and begin operating on July 1. It will be made up of a mixture of Fair Work and industry representatives and will be tasked with issuing sector-specific and industry-wide remuneration rulings to improve safety. A regulatory analysis released alongside the announcement of a tribunal found that 29 percent of owner-drivers are working for less than the minimum wage and that the tribunal could reduce pay-related crashes by 25 percent. The Opposition’s spokesman on transport, Warren Truss, last year claimed there was no evidence to support the argument that increasing rates would improve safety. "Safe rates is a spurious argument at best," he told ATN. Prime Minister Julia Gillard says the tribunal will make sure drivers receive "a fair day’s pay for a fair day’s work" and will reduce dangerous on-road behaviour.